Thread Killers Unite!! Come join in and chat! Okay, so the other thread got to 5000 post and I know there was a goal of that. But, the thread takes forever to load and I'm tired of it, lol. I decided to start a new one. Feel free to join in and chat and vent and make friends! That's why we're here. Feel free to introduce yourself. Just please, no bashing or bad mouthing the others. We're all here to chat about life and everything that gets thrown at us. So, I'm Sarah, a sahm to Rylee. I hope Caden's party goes well Samantha and that everyone got some sleep last night!! I expect pictures later unless of course you're too pooped from all the awesome fun you had. I think you finally killed it!!! My Snark-o-meter is broken. Please be assured that 99% of what I post is not intended to be snarky or judgmental. For anyone who joins Sarah & I (who kept up the old thread) I'm Samantha, my ds Caden had his 2nd birthday party today. His party went great! We had lots of fun, despite him having a little cold. I only took a few pictures, I let everyone else do that. Lol! 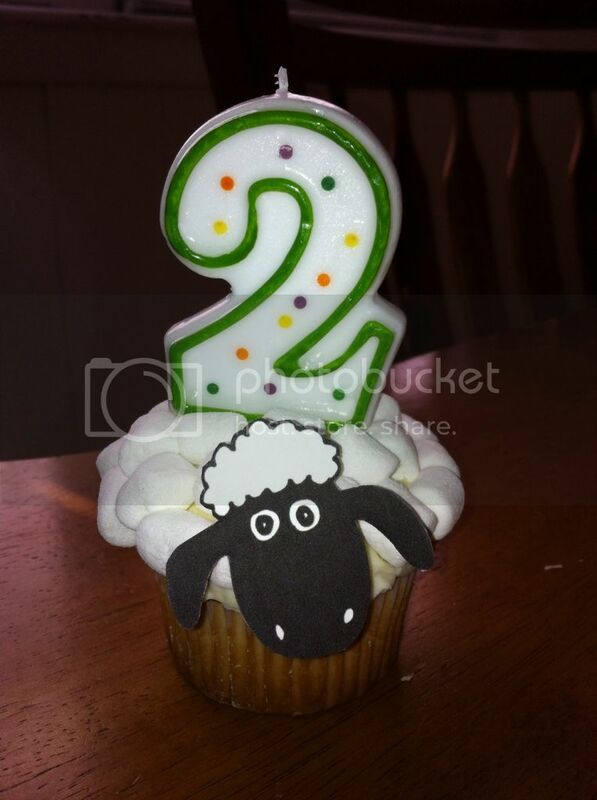 Here's his little Shaun the Sheep cupcake! Here he is wanting to blow out his candle while we sing to him! 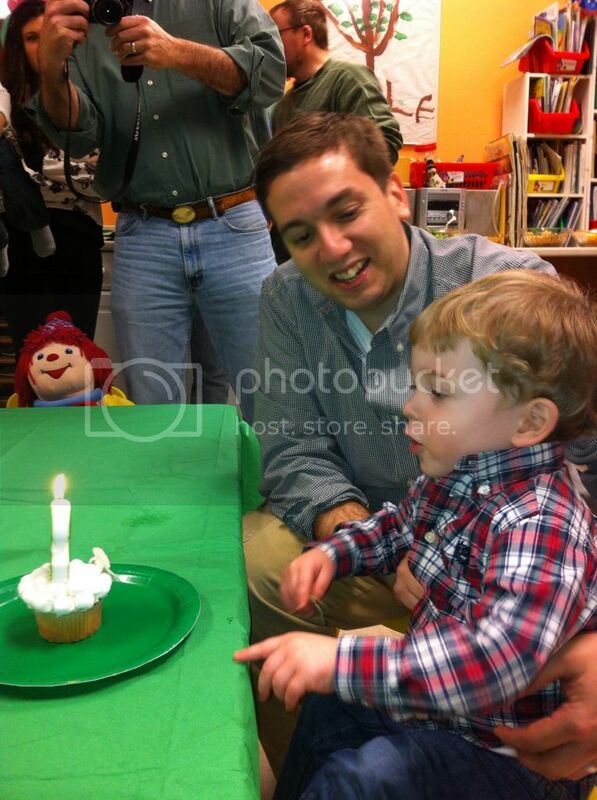 He did awesome blowing out his candle all on his own! Last night on the other hand was rough (for DH). Caden was up every few hours & bc he can get out of bed now he goes to DH & wakes him up. But he went back to sleep easily. And slept until 6:15 when I got up with him & tried to get him to eat breakfast. He hasn't eaten much in a couple days. I hope his appetite comes back tomorrow. Re: Thread Killers Unite!! Come join in and chat! I almost did! But, you replied so I didn't totally! I'm glad it went well and everyone had a good time! It also sounds like he slept better for the most part, no major battles in the night. It was a pretty relaxing day around here today. DH did some cleaning, though it was mostly organizing all of his miscellaneous computer parts he has. I made some sugar scrubs for homemade gifts. I just need to label them and choose who gets what. Sugar scrubs sounds like a nice easy homemade gift. Yeah, they'd probably not taste as good. They are super easy to make! I'm going to make more today. I'm just waiting for DH to get home so that I can get some more lids. Didn't really have plans today. Caden slept ok last night. Was up around 10:30/11 (that's pretty normal) then was awake at 4:30, but with a cup of milk he went back to sleep until 6:30. Pretty good. Ill take it. So I was up changing the sheets & I flipped the mattress by myself trying not to wake everyone up at 6am. It was comical. We mostly played with Caden's new birthday toys. I did some errands- it was nice to go out in the morning before the crowds & by myself. I spent the evening working on some quiet book pages. I have a couple that I started that I would like to finish & give to Caden for Christmas. Almost done with one of them. Hopefully my mom will be able to take Caden tomorrow & I can finish & start the other pages. Watching the Patriots lose now then going to bed. I can only imagine what you looked like while changing everything, makes me giggle. Though I'm sure it wasn't all that funny. I've always wanted to get Rylee a quiet book, but I have no sewing ability and those that make their own don't want to make more. Plus I'm afraid it'll cost a pretty penny. Yesterday was okay, Long. I did finish making all of the scrubs. I have 23 jars. 22 small and 1 large. Mine was ok. Still not getting an uninterrupted sleep, but we are getting better. Slowly. Caden joined me in bed this am around 4. He was completely soaked & had the be changed. Then we came to bed watch Shaun the Sheep (of course!) and he fell back to sleep in 14 mind thankfully! But from 1:30-2:30 I was rocking him. I tried to put him back to bed asleep like 3 times in the hour & as soon as I would close his door or get back into my bed he would wake up & get out of bed that was fun, but other than that at the soaking it was ok. He slept until 6:45 in my bed so that made up for it. DH got up with him in the morning & I slept until 8:30. I took Caden to the library for a bit & then he went to my moms. I was able to finish up 3 sets of quiet book pages and the cover. I just need to bind them. I think I will made button holes & use a ring to hold the pages together. And that's about it. I rested & watched OTH for an hour before going to get Caden. I wouldn't be able to function fully if I got as little sleep as you. At least you're able to get out and about. If Rylee didn't sleep and I was stuck home like I am now I would be bat crazy. Today was okay, DH and I had a little spat but it was resolved quickly. Well within ten minutes or so, still pretty quick. Our relationship has been put to the test a lot lately and we seem to be doing well. Lots of work to do, but still. Now it's time for bed. Hopefully, I would like to fall asleep at a decent time.